1. Clarity. A positive returns experience starts with clear communication. It’s the only way customers will know what to expect. Online retailers should make their return policies simple to understand and easy to find on their websites. A good policy outlines what can be returned, whether customers will be granted a full refund or store credit, how long they have to make a return and if return shipping is free. Taking the time to clearly spell out these details will show customers that the business is one they can trust. 2. Convenience. There’s a reason why people gravitate toward online shopping: It’s convenient. They don’t have to deal with crowded malls or long lines. In fact, they can get anything their hearts desire without ever leaving home. The same concept should apply to a returns process. If it makes sense for the business model, consider simplifying things for customers by including a return label with the purchase. If it would work out better for customers to contact the company for a return, be sure to include the appropriate phone number and instructions on the packing slip. Ensure that there's a way to send shoppers a PDF of the return label, so they can quickly and simply print the label at home. 3. Affordability. 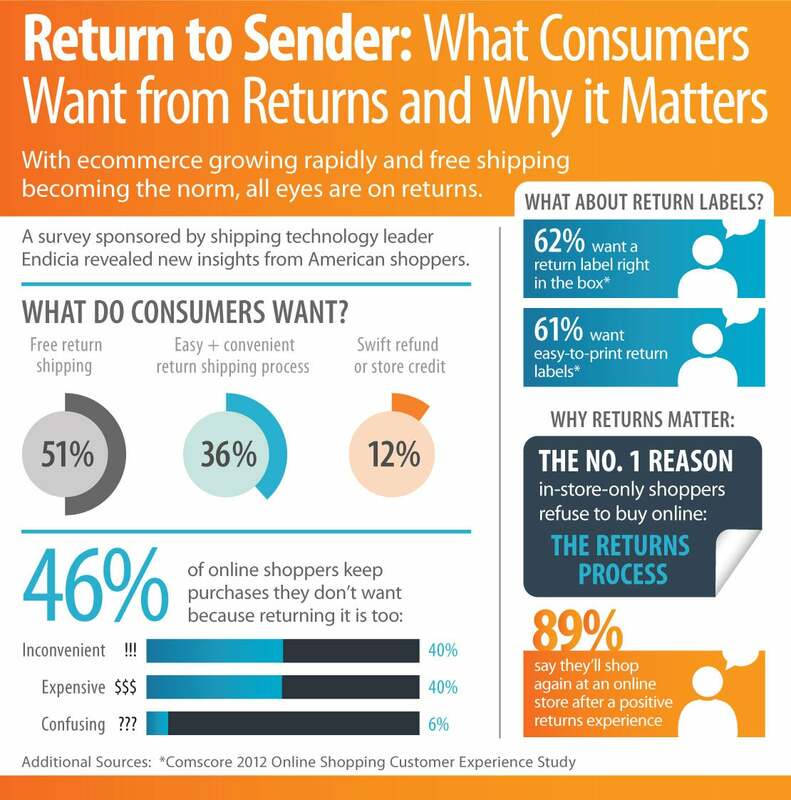 Forty-nine percent of shoppers list shipping costs as the most exasperating part of returning an online purchase. A customer dissatisfied by a purchase isn't interested in paying for a return. To keep customers happy, eliminate or minimize the cost of return shipping. Absorbing the cost of return shipping can be expensive so select the carrier with the best rate. The U.S. postal service provides the lowest cost rate for packages weighing 10 pounds or less, while FedEx and UPS provide competitive rates for heavier items. 4. Flexibility. Nobody wants to deal with the pressure of meeting a tight return deadline. By offering a flexible window of time for returns, a company shows that it values its customers. Thirty days is standard, 60 days is generous and 90 days just might make a company the next great retailer. Retailers have a responsibility to ensure that every consumer touch point lives up to the promise of the brand’s image. See the infographic below prepared by Endicia about how to not let a customer relationship be spoiled by a poor returns experience.